Welcome to The Short Stop Christmas Cookie Exchange! It's all about cookies today. Not my cookies. Your cookies! I've been looking forward to this for weeks - so excited to host a way for you all to share your favorite cookie recipes with one another. Just about everyone I know makes at least one delicious cookie: a family recipe, an online discovery, an old classic, a new twist on a favorite. And, this is your chance to share the recipes you love and to collect some new, tried and true recipes from others as well! - You can post up to three recipes! - You can link to your blog, online recipe sites (Allrecipes.com, Betty Crocker, Food Network, etc. ), or you can post your recipe(s) in the comments - if there is not a link available online and you don't have a blog. - Take a cookie tour! Visit the blogs that have posted a recipe, and leave them a comment when you do. Taking time to leave a comment is so encouraging and means so much to bloggers. - Everyone who shares a recipe will be entered to win one of TWENTY copies of The Gift of the Christmas Cookie. The Gift of the Christmas Cookie is a story of Jack, a heartbroken boy who helps his mother bake special Christmas cookies and learns about how people long ago used Christmas cookies to tell others the story of Jesus’ birth. And, it is the perfect gift to share with you all for sharing your Christmas cookie recipes here today! *The Cookie Exchange links will be open indefinitely and you'll be able to add recipes throughout the season. But, only recipes posted by 5pm on Friday, December 11th will be entered for the giveaway! 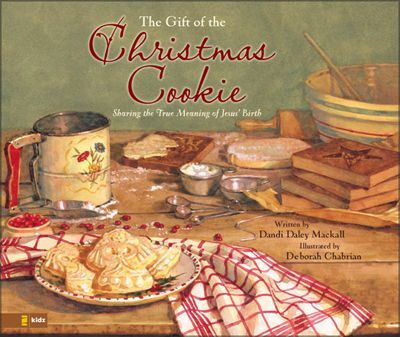 *Disclosure: I was provided 20 copies of The Gift of the Christmas Cookie by the good folks at ZonderKidz as a giveaway for The Short Stop Christmas Cookie Exchange 2009 participants. I've posted mine, but hope it's ok that it's not a cookie, but is a Christmas treat. I love, love, love your recipe! So fun to do an online cookie exchange - thanks for hosting! Merry Christmas! Thanks for hosting. That is such a great book! Thanks so much for hosting! I'm having a Cookie Exchange on the 13th. would love for you to link up! Thanks for doing this Sarah! I am so excited to check out all the links! Everything looks so good already. I'm sure by the end of the day we'll all have tons of new things to try. Oh no! There's a duplication in recipes, we must have been posting at the exact same time! Is there a way to delete mine? I can definitely fine another recipe to share. This is so much fun! I've already found several new recipes I can't wait to try this season! What a delightful carnival you've hosted and it is so perfect for the Short Stop! what a fun blog party - it's making me hungry! Thanks for reaching out to us, Sarah! Thanks for the opportunity to glean new recipes! 1) For those who really hate the taste of alcohol in your food, this recipe is not for you. But if you like that "zing" then these are DIVINE! 2) You can use Brandy instead of Cognac (I do). Cognac is a high-end Brandy made in a particular region in France and is a lot more expensive. What a fun idea! thanks for letting us all link up! thanks so much for hosting! I heard about your blog from Sara -- wonderful. You are always finding a way to be creative and giving! I know you will be so blessed by this and others will be blessed in return. This is the spirit of Christmas and it makes me smile to know you are the author of this whole idea. Do you remember we met at holiday time? Two years ago while you were carrying little Lincoln. I have used the tea lights for a Christmas room scent thing that I have and I'm down to my last couple. They are a sweet reminder of you! Love the idea of the book! I'm treasuring books more and more as I get older. I think it's the hope of having special little ones in my life someday to share them with. This is awesome, so many fun recipes to try! I'm going to have to buy nothing but flour, sugar, and butter when I grocery shop this week. The recipe for Thick and Chewy Gingerbread Cookies is from the greatest cooking publication of all time, COOK'S ILLUSTRATED. I made about six batches of these one Christmas and gave them to everyone in the family instead of gifts. They're amazingly flavorful and a blast to decorate. For some reason, your McLinky would not work for me....so I'll leave my link here. Whew - made it! :) So glad you stopped by and told me about this. Yum!! Thanks for hosting!